Foley tweeted his appreciation for the celebration. Mr. Socko was one of the most popular inanimate objects at the height of WWE’s Attitude Era. First used as a means to try and “entertain” Mr. McMahon while he was in the hospital, Mr. Socko would be used by Mankind (Mick Foley) during matches by taking the sock out of his pants, putting it on his hand and putting that sock down the throat of his opponent, putting them to sleep with the Mandible Claw. Mr. Socko helped evolve the Mankind character from a scary and deranged loner to a comic relief character able to withstand lots of punishment and Foley became one of the cornerstones of the era. Even 20 years later, Mr. Socko still resonates among wrestling fans and the sock puppet made its latest appearance in England. 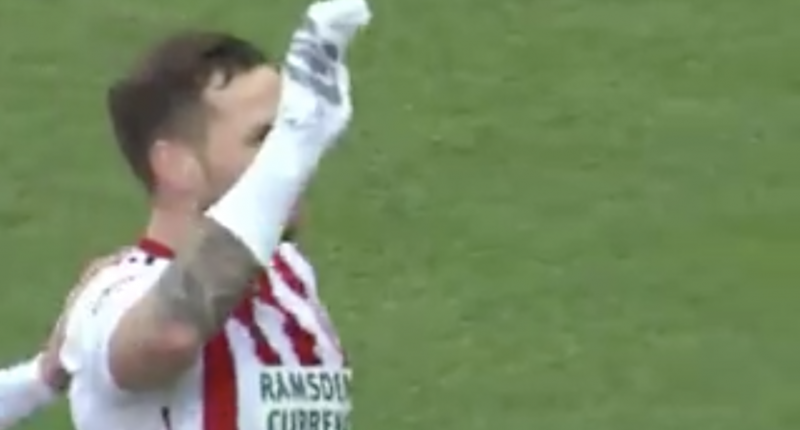 After striker Billy Sharp scored a penalty for Sheffield United, he celebrated by pulling out the sock and giving midfielder George Baldock the Mandible Claw. Baldock no-sold the move but I’ll let that slide considering how cool this is. After seeing the clip, Foley expressed his appreciation for the celebration and seems to have given his post-celebration blessing. Sheffield United drew Norwich City 2-2 in Championship play but Sharp scored both goals so maybe Mr. Socko is giving him some extra goalscoring powers.